Looking for ideas to incorporate Farmer Boy into your homeshool? We grew up reading the Little House On The Prairie series of books, and Farmer Boy was always a favorite. 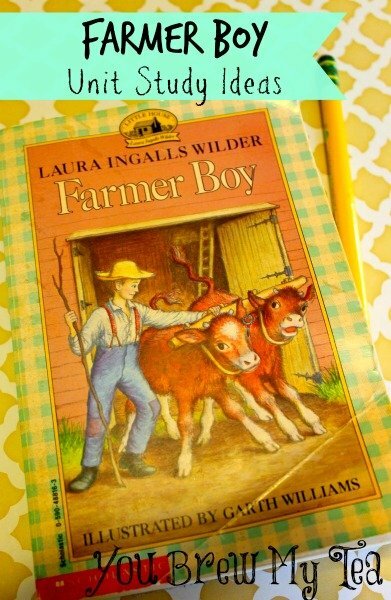 Check out this Farmer Boy Unit Study that is perfect for introducing this book to your children. I couldn’t wait until I had little girl and was she big enough to read my favorite childhood books with me- The Little House on the Prairie series. I had pinned all my hopes on sharing Laura, Mary, Ma, Pa, and baby Carries adventures with her, but she is only 3, and while I have read some of the chapters aloud we are not there yet. But then I realized- “Wait! I have a boy of 6 now, he is big enough, why am I saving it for a girl?” However my boy runs from anything with any girly theme whatsoever so it was a no go until I pulled out Farmer Boy and promised him it was full of boy adventures, even a fight, and well farming. ( I am telling ya’ll I barely snuck this gingham cover past him!) Once we made it through the first chapter he was hooked on learning about life on the farm and Almanzo a boy of not quite nine years old. It certainly made him appreciate his little chore list more! First we read through the book over the course of a couple weeks ( we read two chapters a day on average) which led to many discussions about the differences in the way things were then as opposed to now. We talked about how modern conveniences had changed the world so much- grocery stores meant that most people no longer HAVE to grow their own food. Electricity and large appliances like freezers keep food preserved until you are ready too cook it. Nowadays Families are often busy watching TV, playing video games, and checking their Facebook status -no longer are our only amuse ments -sledding, sitting around a fire with our family enjoying popcorn and milk, making homemade candy, and the simpleness of county fairs. Sad right? At the end of our reading we decided to spend a day living like Almanzo and his family. Sometimes the best way to learn about a subject is to immerse yourself in it, and live it out! We picked a day to commit to no technology such as tv, tablets, or cell phones ( we did use our electricity for cooking and lighting but you could grill and use flashlights and lanterns if you really want to get even more in character. Here are a few of the activities we included in our Farmer Boy mini unit study. Write on “slates”– We used our chalkboard slates to write new words we encountered during our reading as well as for writing out simple math problems. Then I let the kids just free draw and write on their chalkboards for awhile, they became a favorite activity throughout the day since we had no T.V. 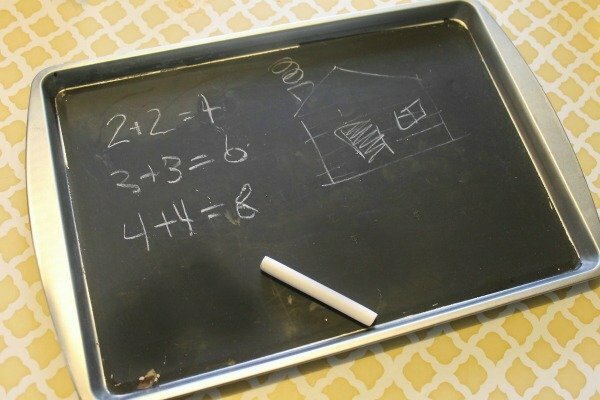 We made our slates by taping off the edges of a Dollar Tree cookie sheet with painters tape and spraying on several coats of chalkboard paint-these will serve us throughout many studies! 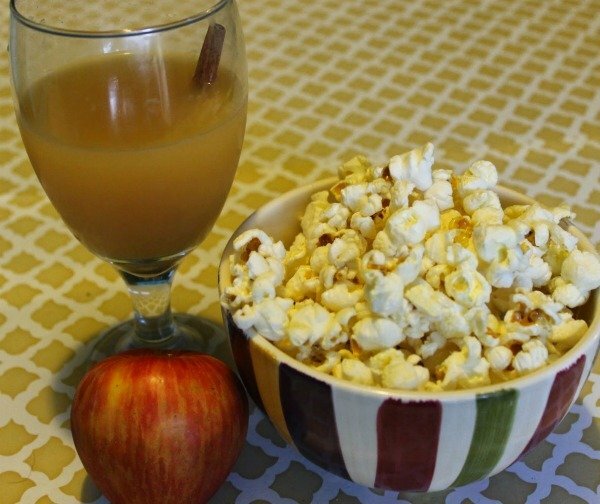 Apple Cider and Popcorn Snack/Activity-Early in the book the family is enjoying popcorn , apples and apple cider around the fire (sounds dreamy right?) So for a snack we had the same- Apple Cider, apples, and salty, buttered popcorn. They were delicious but we also had to try Almanzo’s trick of putting a full cup of popcorn into a full cup of milk to see if it worked- It did! That was a fun experiment and also tasty! Farm Life- We actually have chickens next door on my mother in laws property, this is a great simple taste of farm life for the kids. 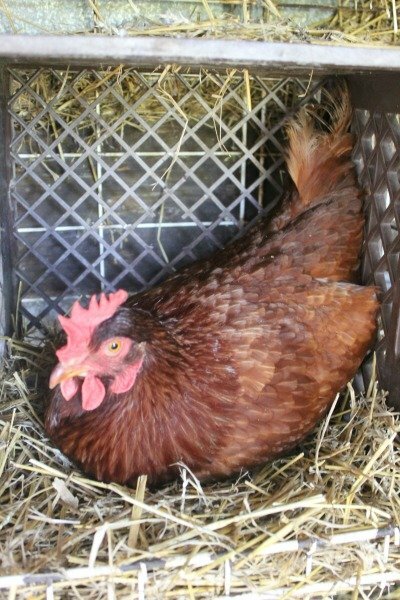 We gathered eggs and threw cracked corn to the chickens and talked about how this was a daily chore for the family along with milking cows, and feeding the rest of the livestock. Ask your child if they think they would enjoy that kind of life. Why or why not? If you don’t have or don’t want to have any kind of farm animals consider a visit to a petting zoo or working farm for a field trip. Make Butter- This is one of our favorite activities and we have done it several times for various studies, and it couldn’t be easier! Just place some heavy cream in a jar-a mason, or baby food jar work great. Add in a marble and a pinch of salt, then shake…for a long time.. Like 20 minutes , this is a great activity to take turns with. Your butter is ready when it is pretty solid, and separated from the liquid- pour this liquid off ( this is buttermilk). Store in fridge to firm up and voila! Plant a milk pumpkin- Try planting pumpkins and trying Almanzo’s prize winning trick of cutting a slit in the vine and placing a wick from the slit into a bowl of milk. This obviously is a much longer project again, but how rewarding at the end! Make Ice Cream- How fun for the kids and how tasty to make homemade ice cream like the Wilder children did when tending house. Making it in a baggie is the simplest way and is really a ton of fun for the kids. If found a simple tutorial here at Tasty Kitchen. Sledding- If you live somewhere with snow you can spend the day sledding and throwing snowballs like Almanzo enjoyed during the winter months. Bake Potatoes- If you are going to cook outside on the grill or have a fire pit going, make potatoes like in the book. Wrap them in foil (not in the book but I just cant toss potatoes directly into the fire and eat them) and let them roast away for a while. Try it directly from the fire plain and then fill them up with butter, sour cream and whatever toppings you and your child will enjoy. This makes a great lunch or dinner! Whatever items you choose to do with your Farmer Boy Unit Study, you are sure to have fun reading these books with your kids again. Sometimes it is great to simply step back in time and enjoy things like they were “back in the day”. Looking for other great Homeschool studies and tips? Check out some of our favorites below!